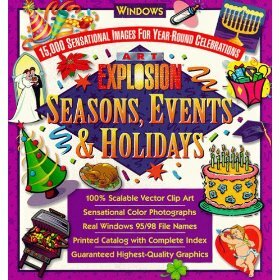 Art Explosion Seasons, Events & Holidays near mint in the box with CD and all the papers and complete Instruction Manual. Ready for you to use and includes product key. It is in near mint or better condition. Nova Development Corp.
Now you can make any event into an unforgettable memory with the world's premier collection of premium-quality graphics for celebrations and holidays: Art Explosion Seasons, Events, and Holidays. Choose from 15,000 sensational clip-art images and photographs, all conveniently arranged in a 150-page Printed Image Catalogue. Or view color previews of entire graphics categories, using onscreen image browsers, which are also included. From birthdays to anniversaries, Christmas to Memorial Day, graduations to weddings, Art Explosion Seasons, Events, and Holidays is sure to have the right image for every event. Using Seasons, Events, and Holidays couldn't be easier. Just add graphics to any word processing, graphics, or desktop publishing program to instantly create unique personalized invitations, greeting cards, banners, party favors, and much more. We just can't get enough of holidays and special occasions. That's why we created Art Explosion Seasons, Events and Holidays. Now you can choose from 15,000 sensational clip art images and photographs and turn every event into an unforgettable memory. From birthdays to anniversaries, Christmas to Memorial Day, graduations to weddings, Art Explosion Seasons, Events and Holidays is sure to have the right image for every event under the sun. Using Seasons, Events and Holidays couldn't be easier. Just add graphics to any word processing, graphics or desktop publishing program to instantly create unique personalized invitations, greeting cards, banners, party favors and much more. Plus, all images are conveniently arranged in a 150-page Printed Image Catalog. Or, you can view color previews of entire graphics categories using on-screen image browsers, also included. Complete Product - Features and Benefits: With Seasons, Events and Holidays, you know you're getting the quality of Art Explosion. Contents are in near mint or better condition. Price We have 1 to sale! We can ship this software through USPS using media rate to save you money.